KSC – LC39B Water Tower – RUSH, Inc. 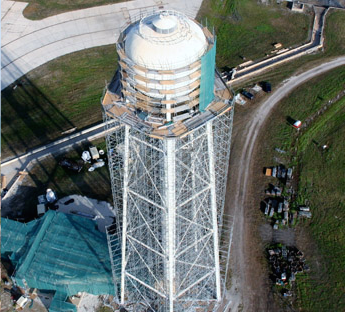 RUSH completed this critical infrastructure improvement project for the water tower and sound suppression piping at Launch Complex 39B in September 2012. These repairs are an essential part of various infrastructure improvements to Launch Complex 39B for NASA’s future space missions. The scope of this project was a complete exterior coating rehabilitation with numerous structural repairs to the bowl, riser, and tower legs to maintain the integrity of the water tower. The water tower is approximately 270 ft in height and in order to complete the coating and structural repairs an intricate scaffolding system was constructed to provide access to the interior of the bowl and perform the exterior coating repairs. 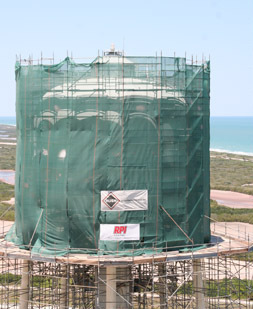 All existing exterior coating for the water tower and sound suppression was taken to SSPC SP 10 (near white) by means of a dry abrasive blast. 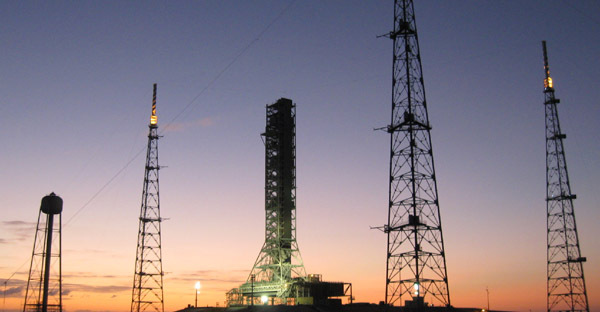 The specified coating system was approximately 4.0-6.0 mils (DFT) of inorganic zinc basecoat and approximately 3.0-5.0 mil (DFT) of NASA’s specially formulated LO3 topcoat. All contractual work was executed in a series of stages due to the access limitations of the scaffolding system. Structural repairs included the replacement of the 14′ overflow pipe and 4′ drain pipe located in the bowl and numerous welded patch plates located on the bowl, riser and sound suppression piping. This critical project was completed on schedule, and to the Owner’s satisfaction.